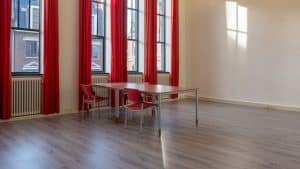 Are you looking for an office for your company in Groningen? The Launch Cafe was voted the best place to work in Groningen by Intermediair Magazine. 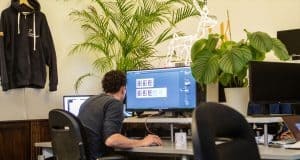 More than a hundred entrepreneurs, freelancers and startups use our facilities in the Herestraat. The ground floor consists of flexible workspaces, conference rooms and a beautiful bar, where you can welcome your clients in style. On the second floor, we have both small and middle sized offices for rent. The Launch Cafe is a special place. 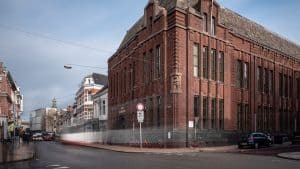 The building is a former bank, 2500m² large and located right in the Herestraat. And there’s lots to do here too: we organize 80 events per year, there’s a workshop for building prototypes, equipped with 3D-printers and our own bar is the center of a vibrant community. 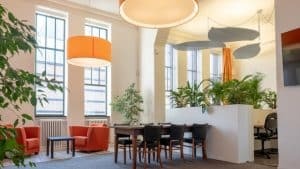 Do you want to rent your own office in Groningen as well as enjoy the advantages of the Launch Cafe’s very dynamic atmosphere? We rent out offices on the first and second floor, equipped with unique facilities for 1 to 8 persons. Contract are a minimum length of 3 months. And of course, next to office spaces, you can also rent workspaces in the Launch Cafe. Whether you want to rent an office space or use one of our fully equipped workspace on the ground floor of the Launch Cafe, you’ll never work alone. Feel free to visit us for a chat and a feel of the place. 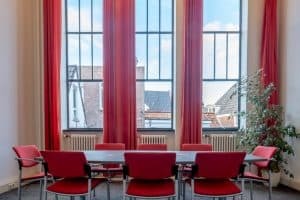 Want to rent an office space in Groningen? If you need more information or have questions about the Launch Cafe, feel free to visit or contact us.